8th Annual RFM Summer Adventure Expo to be Held at New Location! Don’t Miss this Free Family Event at its New Location! Over 80 summer camps from the Richmond area and beyond are gearing up to provide area families with all the information they need to plan their kids’ summer adventures. 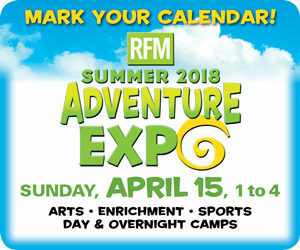 Richmond Family Magazine (RFM) and Peak Experiences Indoor Climbing are once again partnering to bring families the 2018 RFM Summer Adventure Expo, presented by Virginia Family Dentistry, Sunday, April 15, from 1:00 to 4:00 p.m., indoors and outdoors at Peak’s new, second area location, Peak Experiences RVA at SCOR Sports Center of Richmond, 1385 Overbrook Road, Richmond, Virginia, 23220. “We have been amazed by the turnout each year since the Expo began,” says RFM publisher Margaret Thompson. “Parents love having just one destination to get all of the information they need to plan their kids’ summer activities, and the kids absolutely love the fun and games, especially climbing the rock walls at Peak Experiences. We’re looking forward to helping our friends at Peak Experiences show off their brand-new facility that’s right in the heart of RVA!” Thompson adds. The Expo includes a free rock climb for the kids and interactive games and activities from the camp exhibitors. “It is such a fun day for the whole family, and parents will be able to learn about summer opportunities in sports, outdoor adventure, music, and more from area camps and businesses,” Thompson says. The event is rain-or-shine and is free for families. Lunch will be available for purchase from local food truck The Boardwalk and Papa John’s, with sweet treats for sale from the Gelati Celesti truck. Door prizes will be up for grabs, and goodie bags will be handed out to the first 200 families. The Expo will be held on SCOR’s new covered field, visible from I-95 near the Diamond. 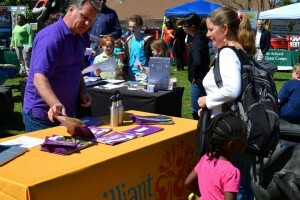 New this year, some of RVA’s favorite family-friendly businesses will join the Expo as sponsors. Mix 98.1 and WCVE are the Expo media sponsors, and additional sponsors are Allergy Partners, At Your Door Pediatrics, Call Federal Credit Union, Chick-fil-A at Willow Lawn, Launch Trampoline, and School of Rock. Additional sponsorships are available. Contact Margaret Thompson at margaret@rfmonline.com for details. Camps can register to exhibit by contacting margaret@rfmonline.com. Visit the event page on Facebook for up-to-date information. More than a list, the RFM Summer Camp Finder is a lifesaver for RVA families! Access the Summer Camp Finder and filter by type of camp, activity, and location. It’s super convenient to find the right summer camps for your kids! P.S. 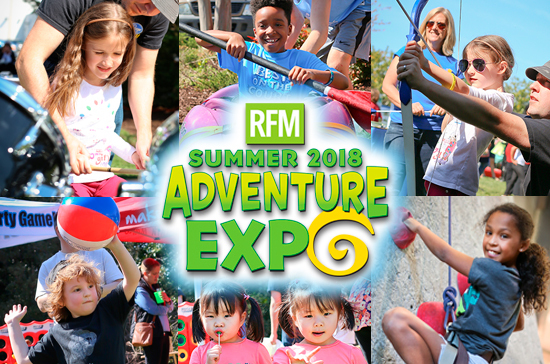 You’ll get to meet many of the representatives from the camps on the RFM Camp Finder when you attend the RFM Summer Adventure Expo, April 15 at Peak RVA.